A Calgary church has lost its charitable status in part because it spends too much of its time advocating on social issues such as abortion and marriage. In October, the Kings Glory Fellowship Association, a non-denominational Protestant group, was told by the Canada Revenue Agency (CRA) that for several reasons, including a lack of clarity on how it spends it money, they could no longer issue charitable receipts. The CRA allows charitable organizations to spend some time on “political activities,” but the cutoff is 10%. A spokesman for the CRA was not immediately available to explain how the percentage of time a group spends on non-charitable works is determined. He said the financial issues are just a “smoke screen” and the real agenda is to “keep us quiet.” Mr. Pawlowski also noted that his church has never been audited by the CRA. 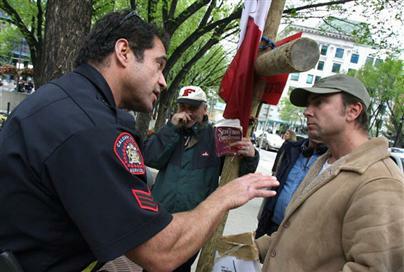 Mr. Pawlowski and his group have a long and loud history of dealing with Calgary officials. In 2007 he was arrested for obstruction and littering after attempting to preach the Gospel at a alternative theatre festival. The case was thrown out. Then last year Mr. Pawlowski went to court to argue against being fined for using a microphone at outdoor events to raise awareness about homelessness. 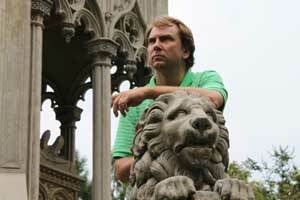 A court ruled on Dec. 7 that tickets violated his freedom of speech. Mr. Pawlowski’s fight against the city was referenced in the CRA documents. Mr. Pawlowski argued he was the victim of a double-standard, issuing a press release that said officials tolerated some special-interest groups but not others. “Calgary officials are so on fire for ‘tolerance’ when it comes to left wing minority groups to the point of flying the flag of the homosexual community on masts in front of City Hall,” Mr. Pawlowski wrote. A number of religious groups, including the Roman Catholic Church and the Salvation Army, all take strong stands against what they see as immoral activities. “The incident was clearly meant to muzzle religious leaders,” Bishop Henry said. Street church pastor keeps pushing the envelope. 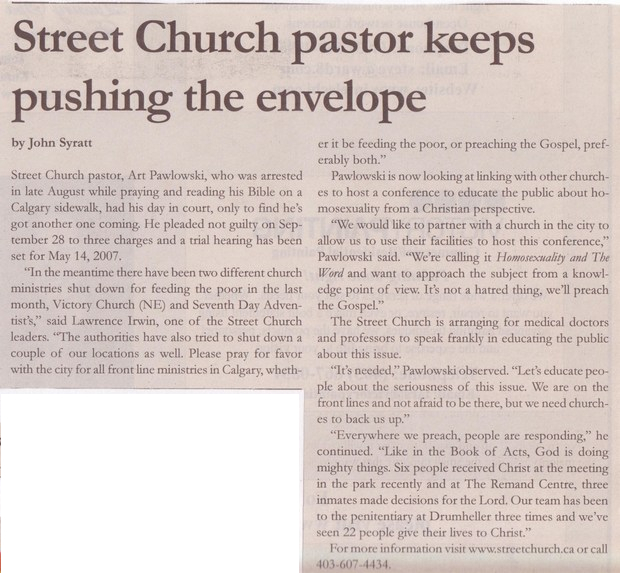 December 5, 2006 Artur Pawlowski Comments Off on Street church pastor keeps pushing the envelope.